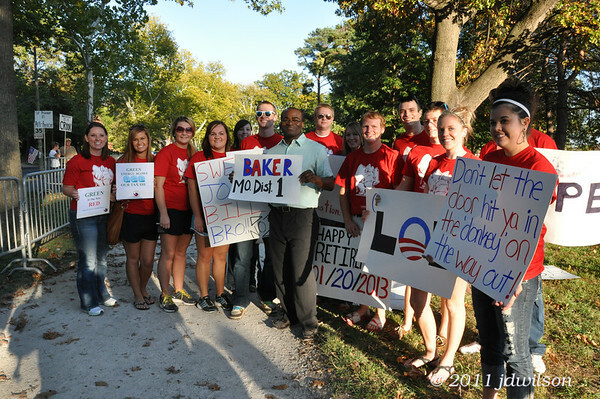 During the President's recent visit to St. Louis, Martin Baker, GOP Congressional Candidate for Missouri District One, was confronted by Obama Supporters, one of whom called him an "Uncle Tom Ni**er". The St. Louis Tea Party was among various conservative groups and activists who showed up to protest at Forest Park, barricaded across the street from Tom Carnahan’s stately home. The event was organized by Gateway Pundit Jim Hoft, and began peaceful–so peaceful, in fact, that many families took advantage of the warm evening and showed up with their children as well. I brought my own with me to collect media, because I think it’s important for everyone, kids included, to participate in civics if they want and see their Constitutional rights in action. ...vile name calling and threats are what we've come to expect from the hope and change set. Seems as if it's beyond the capacity of the proregressive leftist Obamabots to grasp that some people have different IDEAS, ideas which are not based upon the color of their skin, but that are determined by the content of their character... and their brains. I was there. It seems he would "spread the wealth around" has done a fine job of speading poverty around, and hate with it. "Riots here"? Is that the hope and change you voted for? Oh, how I wish I could have been there, but it's good seeing younger faces in the crowd! I'm sorry they were subjected to the kind of verbal abuse that was heaped on them.